for interesting topics on balneology, pelotherapy, healing clays, ozone therapy, and more. Synopsis: Clear communication is vitally important. Understanding base principles, predominant theory, and the scientific application thereof, and then communicating this in a manner that represents the facts is critical to preserving and forwarding the pursuit of knowledge. This correspondence demonstrates the ease in which misinformation and/or miscommunication can occur, especially in the realms of eclectic studies. Please see our notes at the end. I have read your website and looked through some of the messages in the yahoo group. I am considering purchasing clay from [ url removed ]. I was also considering purchasing clay from [ url removed ]. However in their guidelines it states that 'Do not touch "toxic clay" with bare hands. Removal of clay without vinyl or plastic gloves may cause chemical burns and re-absorbtion of viruses, bacteria, and fungus." Now, on your website, nowhere did I see that one needed to wear plastic gloves when using clay. I'm apprehensive about purchasing this clay. Tell me, does one need to wear rubber gloves when one is using clay? Eytons' Earth: Thank you for writing! Undisclosed: Thank you for writing! 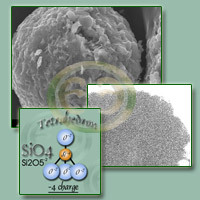 to is the clay AFTER it has been used on the body: This is when it is now " toxic". I have purchased the hydrated bentonite and psyllium seed husks from V.E. Irons, Inc. I have been doing a searching for bentonite healing this past week. 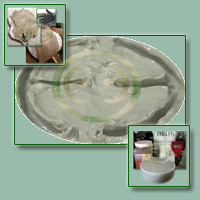 I came across a link that says that bentonite http://www.gutdoc.org/Constipation.htm also absorbs minerals. This has caused me to wonder if it could cause an electrolyte imbalance. Jason, does taking bentonite internally absorb minerals from your body? It is an excellent practice to utilize established sanitary procedures when doing any healing work with the body. Medical standards have been set that at one time were not practiced, and have since saved millions of lives. Proper sanitation under any circumstances is an idea who's time has come! 1. The healing clay has been used on an open wound with significant draining. 2. The healing clay has been used to treat radiation poisoning. 3. The clay has otherwise become saturated with a dangerous substance. 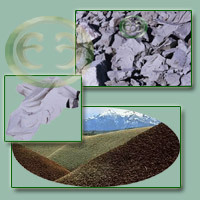 The clay's direct action is a result of clay's ion exchange capabilities. Non-radioactive materials sorpted into the clay will remain in the clay, provided that contact does not cause an ion exchange. This ion exchange is a chemical reaction. When clay is used on the body in a non-medical situation, the amount of matter sorpted by the clay is USUALLY extremely minute. Our observations indicate that it is the body's own lymphatic system that is doing much of the work, having been stimulated by pelotherapy. By principle we always take care in the disposal of used clay. However, this is not because we are afraid! It is a) respect for proper principles and procedures, b) a good habit for any disposal activities, and c) cultivates a caring attitude. Bentonite, upon direct contact, will sorpt substances indiscriminately, dependent upon the chemical makeup of the substances, the clay, and the biological terrain or environment. High PH clays will be far more active in the lower intestinal tract. Low PH clays will be far more active in the small intestines. The bentonites we have tested are high PH clays, and act as alkalizing agents in the body. There is no risk of dietary deficiency resulting from reasonable use of clay internally. Users have reported an INCREASE in the body's ability to utilize nutrients as the result of clay used internally. This has, however, not been scientifically established. Indigenous peoples' throughout history have utilized clay as a daily part of the diet. Clay should always be used with as much wisdom and understanding as possible, but we see no reason to fear the use of quality clays internally. Clay's ability to adsorb nutrients is directly limited to the amount of time it remains in the small intestines. The sheer volume of food eaten compared to bentonite taken should give an indication of why we believe as we do. Studies done by the U.S. Army indicated that clay utilized internally in larger amounts, in order to treat radiation ( Cesium ) poisoning, resulted in a loss of weight of the cattle treated. There may be many reasons for this, especially damage and contaminants in the body. 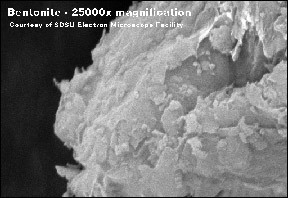 We have a new section on bentonite research articles, including topics such as edible clays, bentonite formation, a definition for living clay, and more.